The Awesome Box allows the community to see what others have found helpful, entertaining, or mind-blowing. Returning something awesome to the Albright Library? 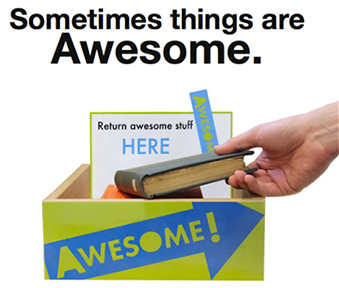 Put it in The Awesome Box located at the Circulation Desk. The Awesome Box allows users to easily cast a physical vote for an item they found amazing or useful. That item gets recorded as “Awesome” so the entire community can see what others have found helpful, entertaining, or mind-blowing. The Awesome Box was created by The Harvard Library Innovation Lab. Returning something awesome to the Library? Put it in The Awesome Box so others can see what you found helpful, entertaining, or mind-blowing.